Hi, I have a home in a village. When I planned a garden surrouding my home all my friends advised me to keep only flower plants, but I had a different idea. 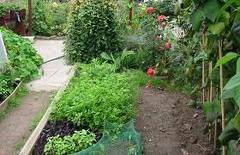 It was to keep vegetable and fruit plants because they would be attractive as well as give nutritious vegetables and fruits. I felt very glad after I had eaten these fruits and vegitables from my garden. My friends who suggested the flower idea also appreciated me for this different and very usefull idea. I'm glad I planted useful and attractive plants in my garden.